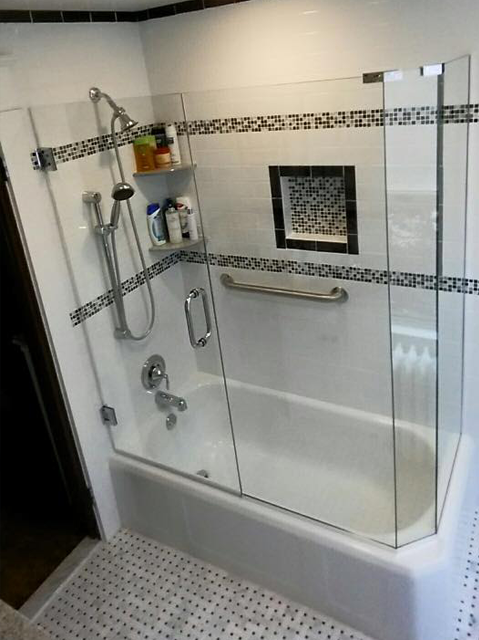 At Bryn Mawr Glass, our customers often ask whether frameless glass doors are exclusively for showers. Is there such a thing as a frameless glass bathtub door? We're happy to say that the answer is yes! There's no reason why showers need to get all the frameless glass door fun. In fact, there are several good reasons to install a frameless glass door around your tub. Keep reading for four reasons why enclosing your bathtub with a frameless glass shower door is a good idea. Splash-Proof: We've all been there. After we (or our children) emerge from the bath, there are puddles all over the floor. A frameless glass door helps contain the splash zone to the inside of the tub. Hold Heat In: Your bath starts out nice and warm, but it doesn't take long for it to get chilly. Your glass shower door will help delay the chill for a while longer. Sleek Look: Whether they're sealing in a shower or a bathtub, frameless glass doors offer a modern, sleek look. Minimize Mold Risk: Shower curtains are a haven for mold. the soft folds cant be wiped clean, and they hold water more easily than glass doors. This is a recipe for a mold-ridden curtain that you don't need to worry about if you have a glass enclosure.